With more device manufacturers eyeing the mid-range smartphone and tablet market, chip designer ARM announced a new suite of silicon built specifically for this growing market. ARM’s new Cortex A17 chip is 60% faster than the current Cortex A9 design with improved power efficiency, while emphasizing the ability to deliver today’s top performance in next year’s mid-range devices. 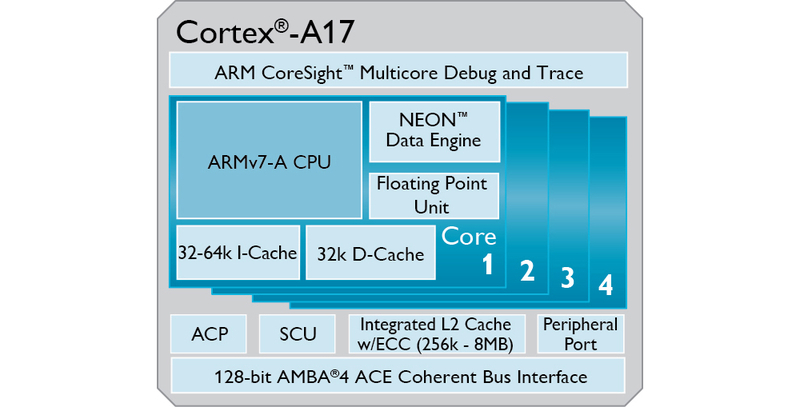 The Cortex A17 processor is coupled with ARM’s Mali-T720 GPU, designed for entry-level mobile devices, smart TVs, as well as automotive infotainment. The Mali-T720 GPU offers support for the latest graphics and computing APIs, which includes Open GL ES 3.0, OpenCL, and RenderScript. The Mali-T720 GPU is a cost-optimized graphics solution targeted at entry-level Android devices developed to reduce an OEM’s manufacturing complexities and time-to-market. It supports the latest graphics and GPU computing APIs, including Open GL ES 3.0, OpenCL and RenderScript, extending the rich visual experience previously found only on today’s high-end smartphones and tablets. The ARM Mali-T720 GPU and ARM Mali-V500 video processor bring scalable, energy-efficient compact multimedia solutions to mid-range devices and are complemented by the ARM Mali™-DP500 display processor. As we mentioned, the mid-range device market is growing rapidly, so rest assured you will be hearing the Cortex A17 name thrown around quite often in the world of processors.